Just in case you weren’t completely convinced of the mind-warping, greed induced insanity that grips FIFA and the leaders of its member federations, the CONCACAF congress has provided further evidence of this. As 10 member federations (Trinidad and Tobago, Cuba, Dominican Republic, Jamaica, Haiti, Turks and Caicos, Panama, Puerto Rico, and St. Vincent and the Grenadines) proclaimed their undying loyalty to incumbent Sepp Blatter in the upcoming FIFA presidential election, the meeting quickly devolved into a competition to see who could say the most ridiculous thing. 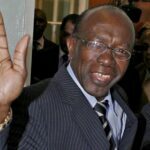 The Trinidad and Tobago FA praised Blatter as the “father of football” while the president of the Dominican Republic’s federation compared the 79-year-old Swiss to Jesus Christ, Winston Churchill and Nelson Mandela. “I think CONCACAF membership is sending a clear message that we continue to support president Blatter,” said CONCACAF president Jeffrey Webb. There were no speeches in favour of any of the opposing candidates — former Portugal international Luis Figo, Dutch FA chief Michael van Praag and Jordanian Prince Ali Bin Al Hussein all of whom were present as observers. Could you imagine being one of the other candidates and sitting in the room as everyone around you spouts that nonsense? On top of that, Blatter was able to speak before the 10 federation leaders did, but his challengers weren’t allowed to say anything on their own behalf. If this doesn’t prove the futility in challenging Blatter’s iron old-man grip on FIFA, then nothing will. “When some speak and others are silenced, democracy and football lose. Elections are, per definition, a democratic process. Otherwise they are not elections,” Figo told Reuters. Sadly, FIFA itself does not agree.